Come camping with us in the Adirondacks! Hike, paddle, explore! See otters, herons, bats and beavers! Listen to loons and mosquitoes! Sing along to the guitar, banjo, dulcimer, ukulele, xylophone and recorder. Great for camp, car, classroom or home. This new CD by Amy Conley and Jean Young includes Jean's original songs using varied instruments to promote an awareness of the natural world and some of our fellow creatures on earth such as the otter, snowy egret, great blue heron, beaver, bat, cedar waxwing and mosquitoes! It also features a canoe song, a hiking song and a campfire lullaby. 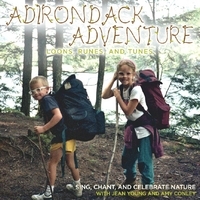 "I’ve listened to Adirondack Adventure many times, and I love it!!! It’s creative, interpretive, educational, fun, and fresh. I love that many of the songs are about the really cool animals that often get ignored. I could see myself using these songs during a nature interpretive program." Katrine Dickau, artist/musician/educator, Hollis NH. "I found this musical adventure absolutely charming! The musicians have organized 12 original songs into a day-long family trip to the Adirondacks, with both adult and children’s voices, and the collection is a whimsical celebration of nature. The song subjects range from otter to loon to bats and a beaver, with delightful sound effects that bring the listener into the woods and along the stream. Our three-year-old granddaughter loves this CD, and I love listening to it with her because of the sophisticated musical touches: interesting key changes, clever lyrics and a variety of instruments – from banjo to glockenspiel and lots in between." Cherry Sokoloski, Fort Collins, CO. Traditional and original songs by Amy sung with banjo, guitar, pennywhistle, hammered dulcimer, concertina, fiddle, percussion, harmonica and more. Children ages birth to six will love the lullabies as well as the fingerplays and dances in this varied collection of preschool songs. 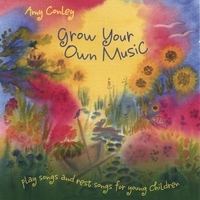 "Any child around you, or the child within, needs Grow Your Own Music as an early if not first sing-along, play-along, move-along CD. It's a must for all singers, all children and appreciators of children and music." Chris Farrow-Noble, Folk Song Society of Greater Boston newsletter. For many years Amy was a music director for camps, learning songs from campers and counselors. Some of her favorites are on here, recorded with banjo, guitar, bass, drums, mandolin, fiddle and more. This collection is enjoyed by all ages! 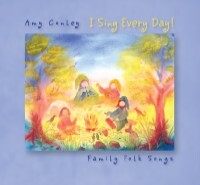 "A delightful and highly interactive collection of folk, play and love songs, I Sing Every Day captures Amy's magical ability to draw all ages into the joy of singing." Judy Gross, Festival Organizer, Milford NH. "I Sing Every Day had my wife, daughter and I happily singing along for many a long car trip. My daughter is a teenager now but we still enjoy listening." Steve Blunt, Songwriter, Nashua NH. To order mail a check for $15 per CD to Amy Conley Music, 102 Elm St, Milford NH 03055. Buy two or more for $10/CD. Free shipping in the continental USA. You can also order through Paypal from this page , but multiple discount not available. Purchase CD's from Amy where she teaches, or at "Toadstool Books" in Milford, "Toyland" in Milford, or "M&C Clothing and Gifts" in Amherst (NH). For digital downloads and song samples visit www.cdbaby.com or www.itunes.com but your contributions via CD purchases here are greatly appreciated. No charge for giftwrapping & shipping to a friend's house.